Figure 1: Rietveld refinement of –COK-14 equilibrated with ambient humidity, recorded using synchrotron radiation (λ = 1.1172 Å). Experimental (black) and calculated (red) XRD patterns as well as their difference profile are shown (blue). The short tick marks below the patterns give the position of the Bragg reflections. The inset shows the refined structure (grey silicon, red framework oxygen, blue water oxygen). Figure 2: Acid leaching of IM-12 zeolite can dislodge the germanate four-ring (dark blue) and shift it into the channels of the contracted framework of Ge-COK-14. Further acid leaching fully eliminates the germanate four-ring resulting in the interrupted (–COK-14) or fully condensed framework (COK-14) depending on the conditions. Zeolites are highly crystalline microporous materials. Their unique properties let them stand out in many applications such as adsorption, catalysis and separation. Inserting heteroelements often improves their desired properties. 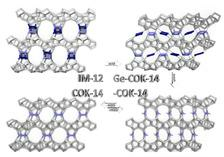 Germanium is known to direct towards extra-large pore zeolites but decreases stability. We managed to fully remove germanium from a germanosilicate zeolite by acid leaching while preserving the silicate layers. These layers are used as building units to generate new zeolite frameworks in a one-step synthesis. This structural transformation is the first practical example of an inverse sigma transformation, which up to now was an entirely theoretical concept. We found germanium to be present in a germanate four-ring in the parent zeolite which is first shifted into the pores before its full removal. In the last 50 years, the interest in zeolite structures has gone beyond pure academic curiosity. The impact of zeolites in the field of science and technology is immense. Nowadays it’s hard to imagine catalysis, petrochemistry and separation techniques without these crystalline microporous materials. Up to date, 200 zeolite frameworks have been synthesized, mostly relying on trial and error, and only very few topologies are really applied in industry . 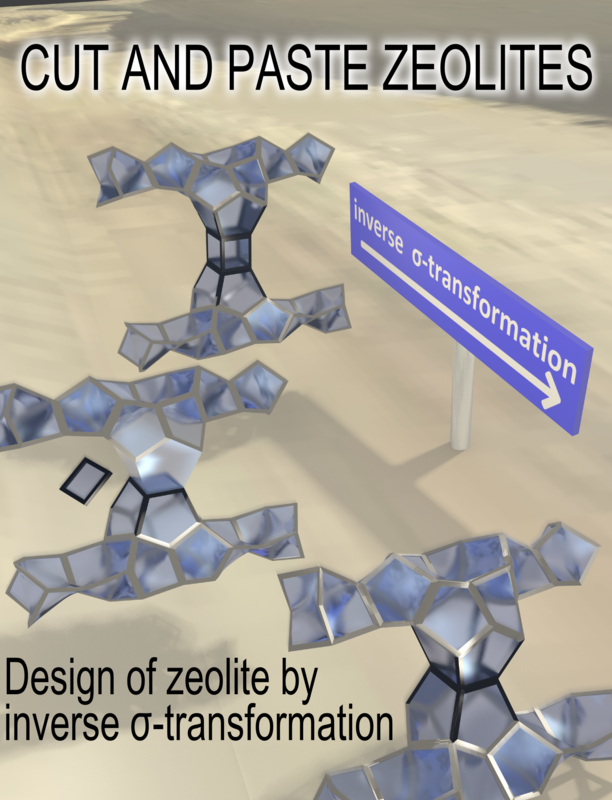 The now practically achieved inverse sigma transformation allows a rational approach to zeolite synthesis: building units from existing zeolites can be harvested and rearranged into new zeolite frameworks. As starting material served the IM-12 zeolite with UTL framework topology , which can be described as dense silicate layers interconnected by double four-rings that contain tetrahedral germaniumoxide units next to silica [3,4]. Like many germanosilicate zeolites, UTL zeolite is unstable towards hydrolysis. Contact to even small amounts of water has to be avoided. Due to this instability, the UTL framework can be exploited as a source for structured silicate layers, serving as building units for new framework topologies. A new highly crystalline and stable phase is obtained by directly reconstructing connectivity of UTL layers in a one-step synthesis. 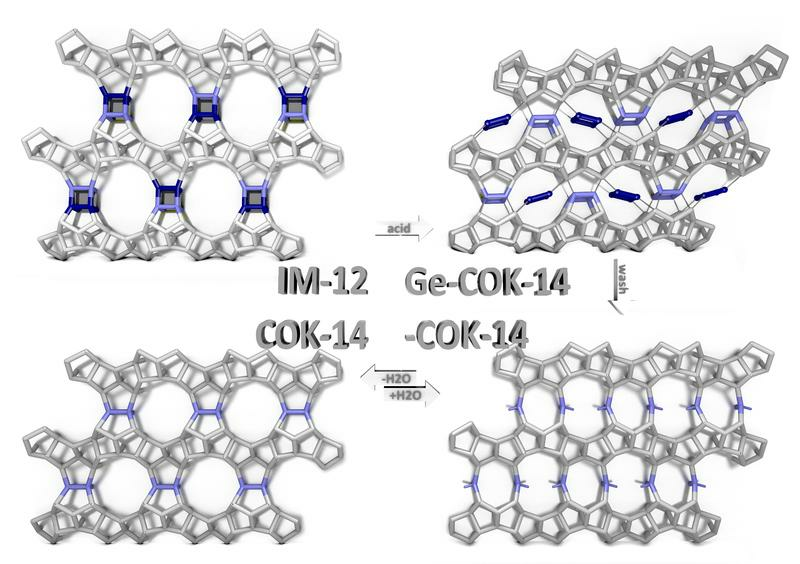 An acid treatment, eliminating germanium from the framework before reconnection of the remaining layers, led to the new zeolite topologies, called –COK-14 and COK-14. Laboratory diffraction experiments indicated that –COK-14 retained some reflections of the parent structure. Indexing of the powder pattern resulted in a unit cell of a = 24.64 Å, b = 13.92 Å, c = 12.26 Å and a monoclinic angle of 109.20° compared to a = 29.00 Å, b = 13.98 Å, c = 12.45 Å and β = 104.91° for the parent UTL. 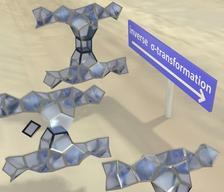 This clearly marked it as a new phase structurally related to UTL zeolite. Since the bc planes in UTL zeolite are parallel to the layers, the new material should contain the same layers but stacked in a different way. 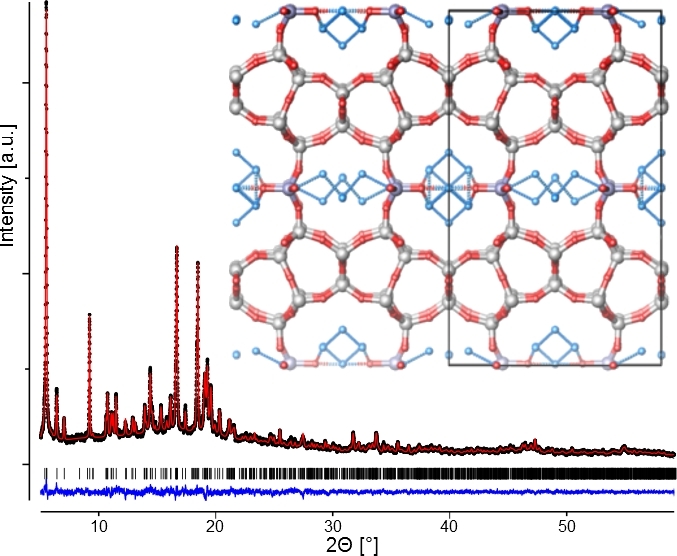 Nitrogen adsorption measurements revealed that a zeolite with 10- and 12-membered rings was obtained, and chemical analysis indicated that it contained only a very small amount of germanium. 29Si-NMR revealed the framework was not fully connected as indicated by the large concentration of silanol groups. To allow a structure solution, a Rietveld refinement of synchrotron data was performed (Fig. 1). X-ray powder diffraction experiments on –COK-14 equilibrated with ambient humidity were performed at the B2 beamline at DORIS/DESY in Hamburg at the germanium K-edge (11.1 keV) in transmission geometry. This data revealed –COK-14 as new all-silica interrupted framework presenting a two-dimensional channel system with interconnecting 8-, 10- and 12-membered rings (Fig. 1, Fig. 2). By further drying while excluding all humidity, silanol condensation takes place, resulting in the formation of the fully connected framework (COK-14) (Fig.2). 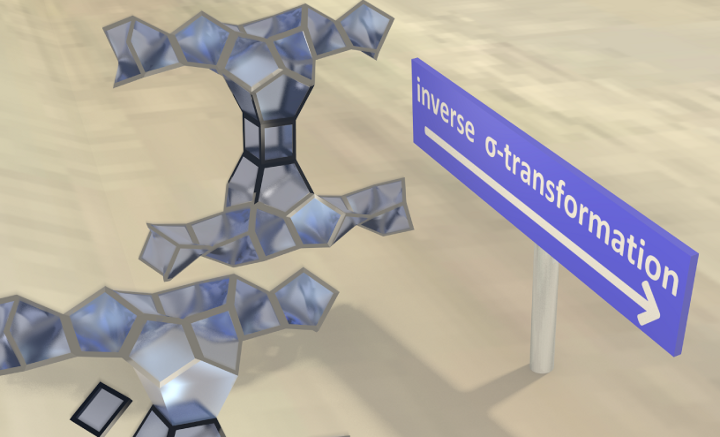 An inverse sigma transformation, only known as a theoretical concept used for simulation of new frameworks, perfectly describes this transformation. Topologically, two T-atoms of the TO4 tetrahedra unit along the edges of the double four-rings merge, reducing the cube-like double four-rings to single four-rings (Fig. 2). This transformation can be seen as the reverse process compared to well-known swelling and pillaring procedures. 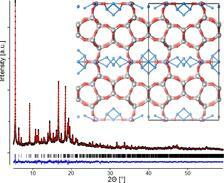 The occurrence of a true inverse sigma transformation of UTL type zeolite into COK-14 was further investigated. An intermediate state, named Ge-COK-14, was captured where the layers already were disconnected but the detached fragment was not yet removed. In this sample, germanium occurred as germanate four-ring in the position that would later become the 12-membered ring of COK-14 (Fig. 2). The COK-14 zeolite family is a valuable addition to the all-silica large-pore zeolite types. More new zeolites with attractive pore architectures could be obtained from zeolites containing heteroatoms like germanium allowing a rational design of zeolite topologies. W. Vermeiren, J.P. Gilson, “Impact of zeolites on the petroleum and petrochemical industry” Top. Catal. 52, 1131–1161 (2009). A. Corma, M.J. Díaz–Cabañas, F. Rey, S. Nicolopoulus, K. Boulahya, “ITQ-15: The first ultralarge pore zeolite with a bi-directional pore system formed by intersecting 14- and 12-ring channels, and its catalytic implications” Chem. Commun. 12, 1356-1357 (2004). J. Paillaud, B. Harbuzaru, J. Patarin, H. Bats, “Extra-large-pore zeolites with two-dimensional channels formed by 14 and 12 rings” Science 304, 990-992 (2004).